BiCE masterfully combines delectable innovation with traditional Italian cuisine, featuring local and seasonal ingredients. Perfectly located in downtown San Diego’s Gaslamp Quarter, just three blocks away from the San Diego Convention Center, BiCE offers Italy’s modern sophistication with affordable menu options. Experience BiCE’s chic and upscale dining experience, along with an authentic warmth and hospitality that Italy is known for. Upholding BiCE’s exceptional reputation worldwide, we’re dedicated to re-introducing Italian excellence to your palate and all your senses. With more than 25 years of culinary experience, Chef Mario Cassineri uses his natural and refined talent to create authentic and innovative Italian cuisine at BiCE Ristorante, located in the heart of the Gaslamp District in downtown San Diego. 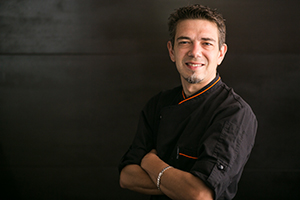 Cassineri serves as Executive Chef and Partner of the restaurant, and was born and raised in Milan, Italy. He infuses each flavorful dish at BiCE with a taste of cultural flare and deep Italian tradition. Driven by a desire to both delight his guests as well as put a modern spin on contemporary dishes, Chef Mario credits his success in the kitchen to two defining attributes: palate and passion. The latter is shown not only in the meals he creates, but also in his amiable and electric personality that fills BiCE’s dining room nightly with positive energy. Chef Mario discovered his love of cooking at just 15 years old while helping prepare food for a charity event. It was then that he realized his culinary creations had the power to bring smiles to the faces of hungry people. Chef Mario went on to graduate from culinary school in Milan, and work with a variety of renowned chefs in Italy and around the world. It wasn’t long before he was running his own kitchen, landing his first chef position at the young age of 23 years old. Mario later went on to join three of Italy’s most celebrated chefs to create a successful restaurant and hotel consulting business. He also shared his love of food with others by teaching culinary arts at the internationally renowned culinary school Costigliole d’ Asti in Piedmont, Italy. Chef Mario joined BiCE Restaurant Group as Executive Corporate Chef in 2005, opening several restaurants internationally and in the United States with his longtime Sous Chef and friend Francesca Penoncelli. Both Mario and Francesca found a home at BiCE San Diego, where Chef Mario has taken the helm of the kitchen and runs the restaurant with an expert team. Here, Chef Mario remains inspired by a community of appreciative diners and enjoys implementing natural and fresh ingredients into a skillful mix of contemporary Italian dishes. One of his proudest accomplishments has been traveling to New York City with Chef Francesca to cook at the legendary James Beard Kitchen on behalf of BiCE San Diego. More recently, he had the honor of leading BiCE to win the 2014 Gold Medallion award for “Best Italian Fine Dining” from the California Restaurant Association. When not in the kitchen, Chef Mario enjoys giving back to the community by participating in charity events and fundraisers, particularly ones that benefit childhood and cancer related charities.